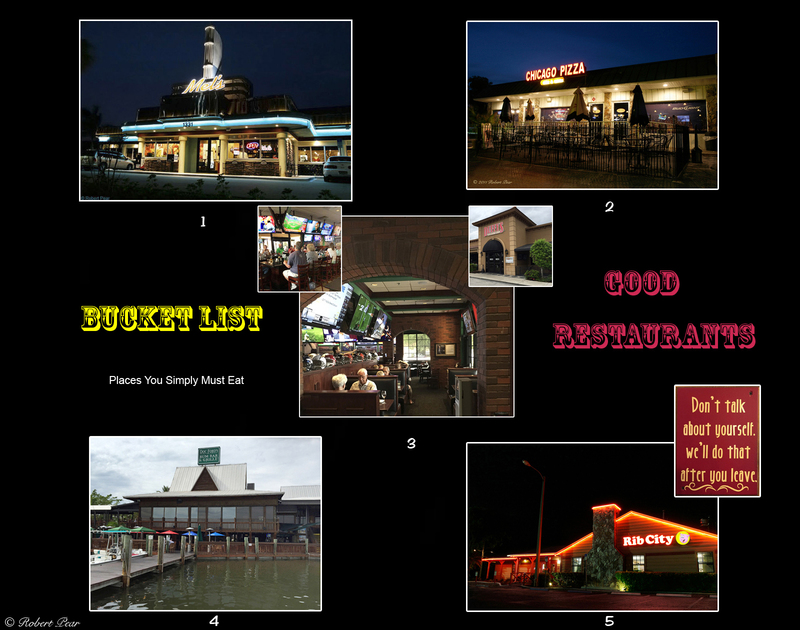 Bucket List - Southwest Florida restaurants you must eat at before you kick the bucket. 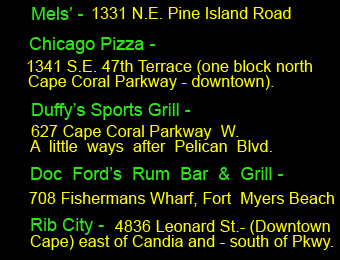 These Restaurants Are In Cape Coral or Fort Myers Beach, Florida. NUMBER 1 : Mel's Diner has delicious fish and dinner specials just about every night. I love the Friday night "all you can eat" fish. It's whitefish of some kind. Very tasty and filling, it comes with tarter sauce and a few sides. NUMBER 2 : Chicago Pizza is one of the most delicious pizza joints I have ever eaten at. Can't be beat - unless maybe you actually live in Chicago. You get a large pizza at a good price with about 5 toppings - not including the cheese itself. Tuesdays - 2 for 1 pizza. (It surprises me that the competition is still in business). NUMBER 3 :Duffy's Sports Grill. Well I decided to toss in a sports bar - why not ? There are multiple locations in Florida. The food is very good. This is one of the most popular restaurants in Cape Coral and attracts a - "H U G E" - number of winter snowbirds and locals - ages 21 to 98. The food is delicious and extremely stuffing - it would satisfy any NFL players appetite. A few bucks more but the servings are also "H U G E". NUMBER 4 :Doc Ford's Rum Bar And Grill. Great place to eat. Here is what you do. Ride in on your own boat. There is boat parking (free). A worker on the boat dock will help guide you in and tie the boat securely. If you must you can drive to the restaurant and park - but it's so much more fun to ride your boat there. I find the grouper to be "top notch and delicious". I also love getting the sweet potato fries. This is one of the most popular items on the menu. This is my and most of my relatives favorite spot to eat out. You can sit inside or outside and the waitresses will do a good job either way. This restaurant is owned by well known local book author Randy Wayne White. My Rating - Five Stars. NUMBER 5 : Rib City - Buy a full or a half rack of ribs - depending on the size of your appetite. There are about four sauces to put on the ribs which are already sitting on the tabletop. Ribs come with a loaf of buttery toast and two more sides. Be sure to choose baked beans as one of them as they are "out of this world" ! My party and I usually also get the cole slaw. BEWARE OF TASTE : These spots are so good that it would be easy to overeat. The size and weight of a few patrons is your clue that the food is both satisfying and economically priced - just to please you ! During the tourist season (which runs from about early November to sometime in April - while the weather is cooler) you may have a good half hour or longer wait before being seated. (Your 2nd clue as to how good the food is). Come early.